Dendrobates is a genus of poison dart frogs native to South America. 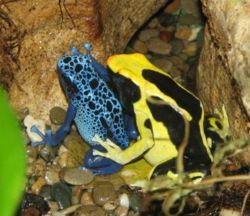 Dendrobates is the second largest genus in the Dendrobatidae family, with over 40 species. This page was last modified on 7 August 2014, at 19:29.